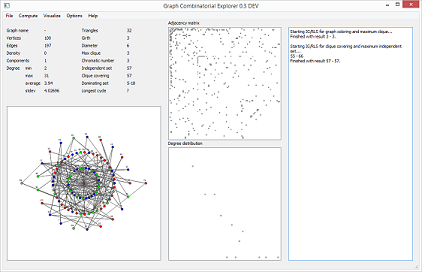 GraphCombEx stands for Graph Combinatorial Explorer: a software for exploration of combinatorial optimization properties of both real-world and synthetic complex networks. 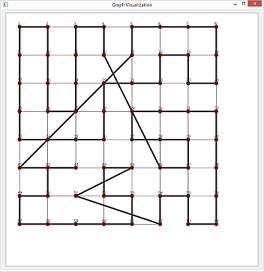 Chalupa, D., Hawick, K. A. GraphCombEx: A Software Tool for Exploration of Combinatorial Optimisation Properties of Large Graphs. ArXiv e-prints, arXiv:1801.09229.
supports a variety of combinatorial properties and metrics. 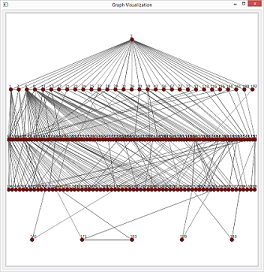 network visualisations: centrality-based, grid-based, tree-based, circular. Disclaimer: GraphCombEx is distributed in the hope that it will be useful, but WITHOUT ANY WARRANTY; without even the implied warranty of MERCHANTABILITY or FITNESS FOR A PARTICULAR PURPOSE.